Besides a nice wake-up in the morning, coffee may also cut the risk of dementia by blocking the damage cholesterol can inflict on the body. The drink has already been linked to a lower risk of Alzheimer’s Disease. Researchers from the University of North Dakota in the U.S. looked at the effect of caffeine on the blood-brain barrier, a natural mechanism which prevents harmful substances passing from the blood into the brain. Previous studies have suggested that high levels of cholesterol – present in fatty foods – cause leaks in the barrier. This leads to the destruction of brain cells seen in Alzheimer’s. Test-rabbits were fed a fat-rich diet of 3mg of caffeine a day, the equivalent of a daily cup of coffee for an average-sized person. After 12 weeks, a number of tests showed that the blood-brain barrier was significantly more intact in rabbits receiving the caffeine-supplements. High levels of cholesterol are a risk factor for Alzheimer’s disease, perhaps by compromising the protective nature of the blood-brain barrier. Alzheimer’s researchers suggest this makes the brain vulnerable to damage which can trigger or contribute to the condition. The study is not the first to flag up the health benefits of coffee. Caffeine can reduce the risk of asthma attacks and help improve circulation in the heart. 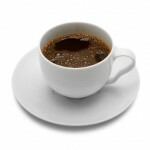 Coffee drinkers have a lower risk of developing certain cancers, as well as Parkinson’s disease and type 2 diabetes. The drink can keep gall stones and kidney stones at bay and has a mild anti-depressant effect which could reduce the risk of suicide.